The ABBYY ﻿FlexiCapture for Invoices is a solution that delivers all essential functionality for establishing a fast, cost-effective and transparent invoice processing procedure from document arrival to posting. It’s a ready-to-run system designed to efficiently transform streams of documents of any structure and complexity into business-ready data; enabling companies and organisations across the globe to dramatically increase the productivity of their AP processes whilst lowering the cost of processing per invoice. The ABBYY ﻿FlexiCapture for Invoices automatically recognises and identifies all necessary data fields from the vast range of document-types; with intelligent on-the-go technology helping to refine data detection on those invoices with exceptional layouts. The software features built-in, country-specific validation rules and adaptable logical and arithmetic checks. It matches against master databases to ensure legal conformity and consistency of data; facilitating fast invoice approval and misbilling detection. Flexibility within the settings means that the processing workflow can be programmed according to the company’s specific business requirements. Therefore, whilst touchless processing is implemented on those invoices that pass these pre-set rules, verifying personnel are able to focus on exceptional documents only; facilitating efficent allocation of resource. 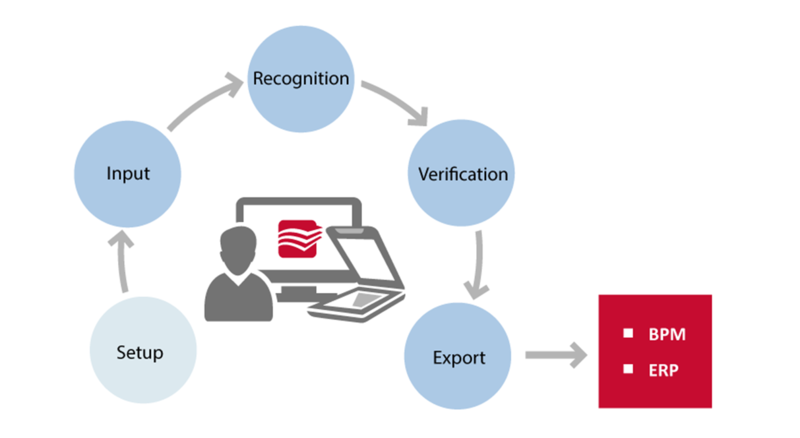 The ABBYY ﻿FlexiCapture for Invoices has the capacity for multi-channel input and document capture right at the point of their arrival by leveraging web-based and distributed scanning, e-mail capture, ftp upload and images taken with a mobile device. This eliminates manual hand-to-hand document transfer and possible delays in processing these different documents, and ensures that no invoice is lost, forgotten or misplaced. Additionally, as data is extracted and validated in exactly the same way both from paper-originated and electronic documents, this allows for a unified input-channel-agnostic invoice processing procedure to be implemented; consolidating and streamlining the whole operation. Once connected to master databases of business units and vendors, the ABBYY ﻿FlexiCapture for Invoices is ready-to-use. Without any adjustment or training, it’s designed to successfully recognise data from the vast majority of invoices and credit notes. Default configuration delivers multi-language recognition and extraction of over 20 fields which can be extended to include others in a couple of clicks. Line items: part number, description, quantity, unit price, tax rate, total, etc. Invoices that successfully pass all required automatic checks are considered completely correct and are assigned a “Valid” status. Such documents can be immediately delivered to an ERP or finance system, and no longer require manual review before this stage. Invoices with a status “Exception” or “Rejected” are routed accordingly for manual review and correction by an accountant or verifying personnel. After all subsequent corrections are complete, the ABBYY ﻿FlexiCapture for Invoices checks validation rules once again and re-establishes the status. Depending on the company’s business rules built into the software, there’s the option for users to manually assign statuses if required. Finally, transaction-ready data can be routed to a workflow engine for approval or delivered directly to a database, ERP or finance system, where the invoice is coded, posted and paid. Invoice images and meta-data can be additionally delivered to records management or database for archiving. Documents with “Rejected” status can be delivered to a special output destination for exceptional management. The ABBYY ﻿FlexiCapture for Invoices represents a highly-scalable enterprise-level solution with client-server architecture. The distributed installation includes multiple user-attended stations dedicated for certain invoice processing operations (scanning, simple and advanced verification) and multiple options for their deployment (local, remote, web-based) which can be combined. 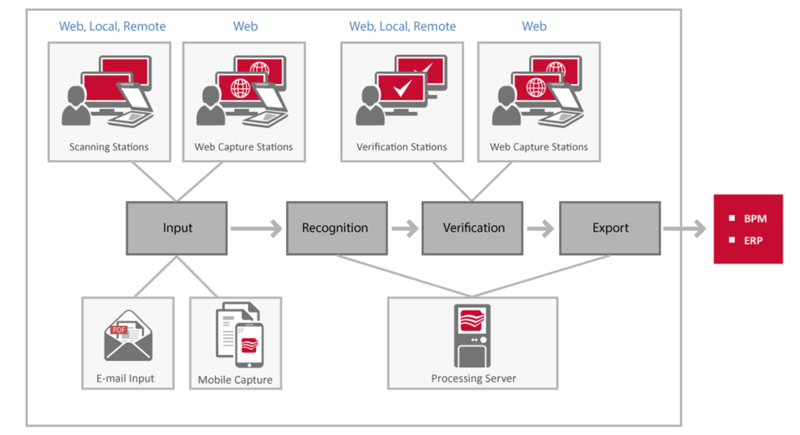 Additionally, the Web Capture station allows document input and data verification in the single web-based environment. All resource-intensive tasks (like document import, data extraction, etc.) are managed by the processing server which automatically distributes them among the processing stations and balances the workload. All necessary tools to enable easy administration of the system and ensure security, scalability, fault tolerance and timely notification of the administrator are provided; preventing against system downtime. A web-based Administration and Monitoring Console delivers easy management of the system and instant monitoring of the performance from any location. The distributed installation is ideal for medium and large companies with multiple locations and many employees (inside and outside the AP department) involved in the processing, and will satisfy the needs of BPO providers. It allows the sharing of operations among the staff and the establishment of a highly efficient and transparent invoice processing procedure. The ABBYY ﻿FlexiCapture for Invoices represents a workgroup-level solution for an AP department. All invoice processing operations, from document input to data verification and delivery to the back-end system, are performed within one single UI environment. Furthermore, the standalone installation is a perfect fit for companies where invoice processing is performed in one single location by several AP employees who do not need to share tasks among each other.